Q3. A _____________ is a single quantitative attribute of an entity. Q4. A metric is a ____________ unit of measurement that cannot be directly observed, but is created by combining or relating two or more measures. Q6. __________ measurement uses hard data that can be obtained by counting, stacking, weighing, timing. Q7. An objective measurement should result in ————- values for a given measure, when measured by two or more qualified observers. Q14. __________ data has no absolute zero, and ratios of values are not necessarily meaningful. 4. degree to which a measure actually measures what it was intended to measure. Q21. 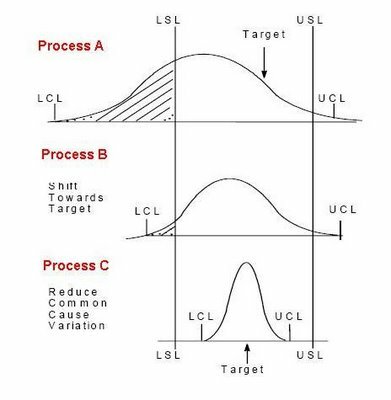 Statistical process control is used to ensure that the process behaves in a ___________ manner. Q24. A _________ is defined as a necessary crossing of directional lines in the graph. Q27. _____________ are those that can be controlled by improving the work processes. Q29. A measurement program is defined as the entire set of activities that occur around ___________ data. 2. Managing the processes to drive the results. Q34. A process is defined as ____________ when its mean and standard deviation remain constant over time. Q40. Improvements to address the ———- causes of variation usually require process or system changes. Q42. Which is the most capable process and why? a. The process that evaluates the action taken, documents the risk results and repeats the cycle of identification, quantification and response. f. The process that executes the plan that was developed in the prior step. Risk Resolution – this process executes the plan that was developed in the prior step.